Windsor Police Service are looking for the public’s help to identify a suspect wanted in the robbery of a west side pharmacy last week. 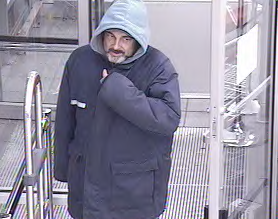 On Friday, February 17th, just before 11pm police were called to the Shoppers Drug Mart located at 2670 Tecumseh Road west for a report of a robbery. The 33 year old female pharmacist told police that a man had approached the pharmacy counter at the rear of the store where she was working and asked her to put some Oxycontin in a bag. He then pulled the sleeve of his jacket up revealing a piece of wood for the pharmacist to see. The pharmacist said that she complied with the suspect’s demand and placed a quantity of Oxycontin in a bag and handed it to the suspect. The suspect then left the store and was last seen in the parking lot getting into an older model four door vehicle which was dark in colour. The suspect is described as a white male, 50 years, 5’10”, medium build, with a brown moustache and a short grey goatee. He was wearing a dark blue jacket with a white reflective stripe on the chest and back. He was also wearing a light blue hood. The suspect was captured on store surveillance video. 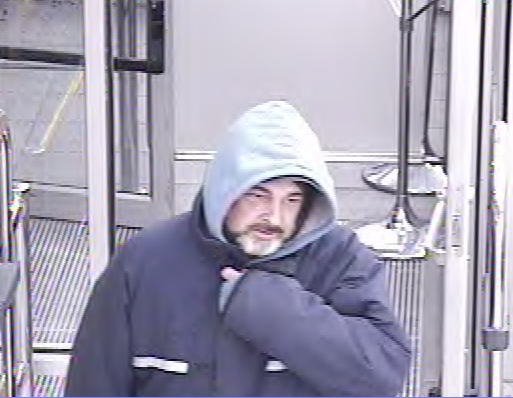 Investigators are requesting that anyone with any information regarding the identity of the suspect or any other information regarding this robbery to call Windsor Police Investigations at 519-255-6700 ext 4830 or Crime Stoppers at 519-258-TIPS (8477).